traveling with the Prime Minister. PF, including by the Minister himself." abuses, electoral fraud and for plundering the economy. MDC is being treated as an equal partner. would be a mistake to not recognize this fact. budgetary support will strengthen proponents of change in Zimbabwe. policy and play a decisive role in Zimbabwe's recovery. country are still ZANU people who have abused their authority in the past. will not be wasted," he said. help Mr. Tsvangirai, then they face the predicament that if he fails, Mr.
Mugabe will still have the upper hand. disposes of the humanitarian aid have sometimes been justified. it with the Zimbabwe government for its return - it was about $7 million,"
non-governmental aid groups, the UN, and the International Red Cross. could follow the European model in the way it is disbursed. that they go to the right people," he points out. and will hold talks with US diplomatic and foreign aid officials. going to be in these commissions,' Matutu. Zimbabwe Election Commission, which is staffed by former military personnel. nominating candidates for the posts. forcefully taken from their homes by three State security agents. trumped-charges of banditry or they would face unspecified consequences. respective homes but to come to court next week," the MDC said. following a High Court order. to stop the State from using Musona, Tarumbwa and Tembo as witnesses. Musona is the Mashonaland West provincial vice secretary. in February after spending more than four months. a statement issued after their 9th annual conference over the weekend. Constantine Chiwenga, with funding from the Reserve Bank, under Gideon Gono. acquitted last week but has vowed he would not forgive his accusers. force you to go and vote. As soldiers we enjoy war,' he infamously said. Council, that is meant to replace JOC, but which Mugabe is yet to approve. Martin Dinha and someone known only as Mujambajecha. spent 4 months in illegal detention before being released without charge. Court application to block this bid to use the trio as witnesses. currency before the end of this year. "randisation" was on the cards. with no foundation at all,' he said. continue with the regime of multiple currencies." coming from, I have absolutely no idea". zone with problems Zimbabwe has suffered in the past and could still suffer. allegedly charging exorbitant rates of up to US$3 000 per night. week and offered hotels, twice the current room rate plus 16 percent. between US$1 000 and US$3 000 per night. He said he was shocked by "this level of greed". "This is the greatest mistake of our time. We have lost out due to greed. influenced by a desire to sabotage the economy and the inclusive Government. has seven stars, does not charge that." Confederation Cup has moved to Botswana. for us should be volumetric because we are rebranding,'' he said. not dubious. We expect them to show maturity and reasoning. contracts with the industry itself,'' he said. and he farming, for the last 27 years. realised: a black person was a freehold farmer of a commercial farm. area, a church hall, and numerous farming facilities. him to sell an uninhabited smaller portion of the farm if necessary. repeated requests, they could not satisfactorily verify the amount. (although on a reduced scale). application, which will be heard tomorrow (4 June 2009). country is appealing for food aid. questions to ask the accused. There is a chapter called "lawyer's tactics". him and they had many giggles about this. released. The prison officers were very polite and helpful. developments on any of these properties. grab) illegal. It also declared the Fast Track land Reform Programme racist. It was against this background that we went into court on 20th March 2009.
commenced on 23rd March 2009.
state land. No argument from our lawyer was entertained here. even pay its civil servants wages. the land but is all about the house. the lawyers is not at all correct. used outside the courtroom despite signs saying they were prohibited. it was against the accused (my husband). to try fed the nation. and was the state witness in the case! forever have a criminal record for merely trying to stay on his farm. survive. We are both qualified and experienced in agriculture in Zimbabwe. World Cup soccer in 2010.
if we had vacated and to make sure we had not vandalised the property". the police have any regard for the laws of Zimbabwe. Mike Campbell, left, with daughter Laura, her husband, Ben Freeth, and their two children in 2007. Campbell, who was born in South Africa, says his family's roots in the region date back to the early 18th century. "We're not British or Scottish or anything," he says. "We're African." The 75-year-old Zimbabwean was severely beaten last summer by marauders who wanted his farm. He and his wife live through a second invasion in spring, but their grip on the homestead is slipping. Reporting from Chegutu, Zimbabwe -- Possession is nine-tenths of the law. That's Mike Campbell's bitter motto. "The moment you move off, you're finished," is how he puts it. The thugs who want his farm almost finished him. They beat the 75-year-old so badly last July he hasn't been quite the same since. They broke his wife's arm. But the Campbells weren't finished yet. Ignoring their nightmares and their forebodings, they went home to their farm. Returning to the land where he'd lived for 36 years, Campbell had prepared himself for the empty closets, the looted farmhouse. But he wasn't ready for the sight that greeted him, driving in the gate that August day: All the farmworkers had gathered in welcome. "It was quite an emotional time. They were shaking hands. I even got some hugs, which no one would believe. But I did," he says, sounding almost surprised. Relieved to be alive and back home, Campbell got on with his job. But when he sat down to calculate how much fertilizer to spray on an acre of crops, the numbers mocked him. He tried again. And again. But a simple sum he'd done all his life was beyond him. "I just can't work it out. It's like a closed book," he says. He forgot things or lost his way in the middle of a sentence, as if he'd aged overnight. He felt useless and depressed. His doctors say he sustained brain damage in the beatings. "I'm very much slower than I used to be. My brain doesn't work," he says over a cup of tea. "It does. A little bit," his wife, Angela, insists gently. "A little bit," he frowns. "But not much." Hardened after years of loss and disappointment, the old farmer can be a little gruff at times. Angela Campbell (nowadays gently correcting anything misremembered) has always been the soft, idealistic one, the foil to his tough, cynical side. Whenever she sees their ancient chestnut horse, Ginger, standing patiently on the veranda outside the window, she hurries to feed him slices of bread. It is she who picks the ticks off him, and carefully washes the cancerous growth on his eye. It is she who worries about him now. Thousands of farmers were forced off their land when President Robert Mugabe told war veterans to invade white-owned farms in 2000. The seizures destroyed agriculture and the economy, ultimately undermining the entire public sector, including health and education. A top ruling party official was determined to get Campbell's lush 3,000-acre citrus and mango farm, Mount Carmel, about 60 miles south of the capital, Harare. But Campbell clung on. Even after last year's beating, Campbell, bruised and frail, was unbowed. In an interview for an earlier story on the tenacious farmer, he said: "I don't think we would ever have given up." In a sense, Campbell outlasted Mugabe: He lived to see the president forced to agree to share power with the opposition last September. Then Campbell and 77 other farmers won a landmark case in November challenging the farm evictions. Southern Africa's highest court, the Southern African Development Community tribunal, ordered authorities to protect farmers against eviction or harassment and demanded compensation for past evictions. "I thought we'd reached the end of the road," Campbell says. When the unity government was sworn in early this year, it seemed Campbell had won. He'd held on just long enough. But within weeks, Zimbabwe's High Court -- largely stacked with Mugabe allies and recipients of former white-owned farms -- rejected the judgment of the SADC court. Dozens of farms were invaded. As leader of the appeal, Campbell was a prime target. The invaders, led by a war veteran named Chimbambira, arrived at Mount Carmel on April 3. There were about 10 young thugs, armed with pellet guns. But about 150 farmworkers, afraid they would lose their jobs if Campbell left the farm, confronted the invaders and chased them away. The next morning, a phalanx of riot police arrived and beat or arrested many of the workers. That night the invaders were back, on the Campbells' veranda, singing war songs. "They were beating on the door and I heard the grindstone going, as if they were sharpening something," Campbell says. "Then they smashed the kitchen door and got into the kitchen." Piercing screams drifted from the workshop, where the thugs were beating up a worker. Campbell stood, terrified, in the hall, listening to the invaders on the other side of a locked door. He remembered the moment last June when he was hit on the head by other ruling party thugs and knocked out cold. He knew he couldn't survive another beating. "I decided I was going to shoot anyone who came through that door. I said, 'Look, if you come through that door, I'll shoot you. You'll be a dead duck.' Otherwise they'll hit you on the head and you're dead." The couple radioed their family, who live on the neighboring homestead. Their son-in-law, Ben Freeth, and a friend crept through the garden to the other side of the house, where Angela Campbell let them in. "Once they realized we had reinforcements, they backed off," she says. Police initially refused to come, but eventually arrived about 4 a.m., warned the invaders to be quiet and left. Late the next afternoon the Campbells returned from lunch at their daughter's neighboring house. The thugs surrounded the house, shouting threats and firing pellet guns. "Just as it was getting dark they started to become very threatening," Angela Campbell says. "The threats became worse and worse. They built a huge fire near the house." Family and friends came over to help defend the farm. But because Mike Campbell was such a target for arrest, the family decided that he and Angela should leave until things settled down. They feared he would not survive a jail stint: Farmers, especially ones involved in the SADC appeal, have been recently arrested and jailed for being on their own farms. "I have always agreed with the theory that if you are seen to move, that's the end," he says. "But they were so threatening, and we'd been beaten up nine months before. "I don't know what I was thinking. I thought it would just be for one night or two nights." But a few days went by. And then a few days more. The realization crept up like a cat padding silently into a room. If Campbell was right, if possession really was nine-tenths of the law, then after years of struggle and resistance, they had finally lost the farm. Visiting Freeth's house, I take an evening walk with him to the edge of Mount Carmel farm. A tractor putters, harvesting the last of the Campbell's $600,000 mango crop. Youths mill about. But when they see us on the border of the land, they shout furiously and give chase. "Come here!" one orders. "Come here! I'll shoot you! I'll cut your neck." We leave, steadily walking back to Freeth's house. I follow Freeth, trying not to break into a run. The farmer and his wife cannot get close to the eight cows and their calves, who rely on them and their workers to fill the water trough. No one knows the fate of Angela's two cats. No one knows how the old horse Ginger is doing. "He won't make it through the winter," says Campbell, gruffly. Campbell has not given up. Not yet. But he's close. "But Mike is a pessimist, by nature," Angela says softly. "I'm optimistic." - There are no United Kingdom or European Union economic sanctions against Zimbabwe. - Current EU measures are carefully targeted against 243 individuals and organisations responsible for the worst excesses of the previous regime, in terms of human rights abuses, political violence, corruption, hate speech and undermining the rule of law. - These measures have no adverse effect on ordinary people. - The economic collapse of Zimbabwe and its infrastructure is the result of the ruinous policies of the previous regime. - treat people with HIV and reduce the rate of infection. The United Kingdom is fully committed to helping the Inclusive Government implement the democratic and economic reforms essential to improve the lives of ordinary Zimbabweans. The Herald’s obsession with bogus issues is not the road to the future. Zimbabwe begins today with a visit of a Swedish delegation. presidency in July, are due to assess Zimbabwe's ongoing reform process. cooperation in the Swedish ministry for foreign affairs, Jan Knutsson. department of the Swedish ministry, Pereric Hogberg. "The visit is related to the forthcoming Swedish presidency of the EU. told inthenews.co.uk in an interview. reform process of the transitional inclusive government." Democratic Change (MDC) figures are due to meet the delegation. Zimbabwe's ruler since independence in 1980.
hyper-inflation blamed on the former's ill-advised policies. law before assisting the unity government with direct financial aid. normalise relations between Zimbabwe and the EU," Ms Weibull added. differences, resulting in the bloc imposing sanctions. as well as an arms embargo. economy soon after the national attained independence. following the government's constitutional making process. not people driven it's a political party driven process." constitutional draft of 2000 will not change their stance. government which was rejected at a referendum. process which allows Zimbabweans to write their own constitution." the whole purpose, we want the opportunity that's why we are about process." not support it," said Madhuku. detached from the influence politicians. That should be the starting point." parliamentary process, he will not accept it. being charged with occupying so-called state land 'illegally'. Veterai, who has led the invasion on the Nesbitt land since last year. Nesbitt before court for refusing to vacate the property. throughout the country, and over four thousand people have died. infrastructure: social services and health care. were not collecting refuse anymore. the clinic and you were affected by cholera you would not be attended to." Rainy season makes things worse. health crises like the current cholera outbreak will continue. "So, before it ends - it will start again." kilometres is common in urban areas these days, according to Ms. Singizi. looking for safe water," Ms. Singizi said. has drilled over 140 boreholes in cholera-affected areas. communities there won't be a resurgence of an outbreak." implement changes as fast as desired. them? But that is a story for another day. hospital on Sunday May 24.
mattress. They were also advised to bring warm water every day for her bath. We arrived in Bulawayo too late to visit mum on her first day in hospital. patients as well. I understood completely and apologised for my ignorance. asked why they just did not get rid of the useless hip of rubbish. She responded that the order had not yet been issued. nurses were occupied with other patients. because the hospital had none in stock. hospital for as long as the life of a light bulb. power cuts. The hospital itself does not provide such luxuries. collect repellents. It really is quite unbelievable. without family, it is difficult to see how such patients could survive. has no medication for patients be called a hospital? that I have witnessed firsthand. one cannot talk of a restored health sector. delivery services are restored, the situation will be catastrophic. JOHANNESBURG, 3 June 2009 (IRIN) - The US Department of Agriculture's Foreign Agriculture Service (FAS) is predicting a slight increase in Zimbabwe's maize yield per hectare in the 2008/09 harvest. FAS conducted satellite and ground surveys from 23 to 27 February, when crop growth was near the maximum leaf area index during mid-season, according to a report released by the department. Factors working against a better harvest were dollarization, making inputs too costly for small-scale farmers, a drop of 85 percent in seed production capacity since 2000, and the poor quality of available seed, combined with shortages of all other inputs such as fertilizers, lime, pesticides and diesel. Zimbabwe's 2007/08 maize harvest of 580,000mt was the worst on record and led to humanitarian organizations providing emergency food assistance to about seven million people. Zimbabwe's national maize requirement is 1.8 million tons. The maize yield estimate per hectare was estimated by the FAS at 0.44 tons, a slight increase on the yield from the previous year of 0.40 tons. The joint World Food Programme/Food Agriculture Organization crop assessment for Zimbabwe is expected to be released in mid-June. JOHANNESBURG, 3 June 2009 (IRIN) - The European Commission (EC) has allocated US$11.3 million in humanitarian aid to help people in Zimbabwe affected by the breakdown of essential health and water services. "The new unity government has to address numerous challenges to place Zimbabwe on the path to recovery. The country ... is facing an enduring humanitarian crisis, compounded by the collapse of basic social services," Olli Rehn, the EC's Acting Commissioner for Development and Humanitarian Aid, said in a statement on 2 June. The funds have been earmarked for medicines and medical supplies, water treatment equipment, and spare parts to upgrade water infrastructure; projects are to be implemented by non-governmental relief organizations, UN agencies and the Red Cross/Red Crescent movement. As a result of Zimbabwe's protracted socioeconomic crisis, access to health services and safe water has sharply deteriorated, "as demonstrated by the largest cholera epidemic ever recorded in Africa," the statement noted. Life expectancy has been dropping, maternal mortality has dramatically increased and high rates of HIV infection prevail. "It is our duty to bring timely and consistent support to assist ... at this critical juncture," Rehn said. The EU is the biggest donor to Zimbabwe's public health sector, providing at least 60 percent of essential drugs available. International donors suspended development assistance to Zimbabwe after elections were found to be neither free nor fair, but the country's extensive needs prompted the humanitarian community to expand its recent request for funding in the Consolidated Appeals Process (CAP) from US$550 million to around $719 million. According to the CAP document, six million people have limited or no access to safe water and sanitation, 1.5 million children require support to access education, 800,000 people are in need of food aid, and 44,000 children younger than five years need treatment for severe acute malnutrition. "Donors realize the importance of not only addressing the symptoms, but also the root causes of many of the humanitarian problems, such as the recent cholera outbreak and food insecurity currently witnessed in Zimbabwe," Muktar Ali Farah, the Officer in Charge at the UN Office for the Coordination of Humanitarian Affairs in Zimbabwe, told IRIN. "The 'humanitarian plus' activities included in the revision of the CAP 2009 ... will provide donors with the window needed to enable them to invest in these early recovery activities that are still considered to be of a time-critical and life-saving nature." Funding provided outside the CAP 2009 was also significant and "currently amounts to $158 million, of which $77 million is for food aid, $32 million in support of food security and agriculture, and $29 million for the cholera response," Farah said. The Southern African Development Community has provided $30 million in agricultural support directly to the government of Zimbabwe. USAID, another major donor, has also reported funding outside of CAP initiatives, but the EC is still Zimbabwe's most important donor, having provided well over $800 million in both humanitarian and development aid since 2002.
a tougher stance with his ageing counterpart in Zimbabwe. address, Zuma merely made a passing mention of the plight in Zimbabwe. how this would be made possible. birthday will be a national holiday. 500kg of ivory to his homeland. were escorting the ivory to let it through. The three sought the owner of the ivory, who was identified as Wu Ming Quan. The ivory was detected on arrival at Beijing International Airport. to Harare or was still in China. yesterday appeared before magistrate Ms Jackie Munyonga. They are denying the allegations. which has due jurisdiction over such serious cases. She remanded them in custody to June 18.
in shady deals and smugg- ling. supplied) were assisting people in evading duty payment. ivory, which was stashed in bags, out of the country. US$75) and were said to be having flamboyant lifestyles. MASVINGO, June 3 2009 - Eight foreign nationals were on Tuesday arrested by the police at 20 kilometer peg along Masvingo - Beitbridge highway after being found in possession of over 20 tonnes of copper cables. The eight, who are suspected to be four Cameroonians, one Ghanaian, and two South Africans were being assisted by Zimbabweans who could only be identified as the Bachi brothers. The police in Masvingo have since confirmed the arrest of the eight in connection with the smuggling of copper cables. “We have since arrested them and they are in police custody assisting us with investigations. The Volvo haulage truck which they were using was impounded by the police. “We were given a tip off that some two brothers of the Bachi family in Masvingo near Nemanwa Growth Point were also assisting those guys to steal copper cables which they were smuggling to South Africa,” said police Provincial Spokesperson Inspector Phibion Nyambo. The police suspect that the cables were stolen from either Zimbabwe Electricity Supply Authority (ZESA) or Tel-One. The monetary value of the cables was not yet known by Tuesday. The syndicate leader who is believed to be a Cameroonian who could only be identified as Engwegan, was staying at Great Zimbabwe’s Ancient City Hotel while his accomplices were staying at Peter’s Lodge about seven Kilometers out of town. Four other small trucks which were being used in transporting cables from various places in Masvingo and Gokwe to South Africa were impounded. “These people were using smaller trucks to transport such cables from different places. They were caught with 350 kilogrammes of stay wires which they had taken from Gokwe,” added Nyambo. The syndicate will appear in court soon. 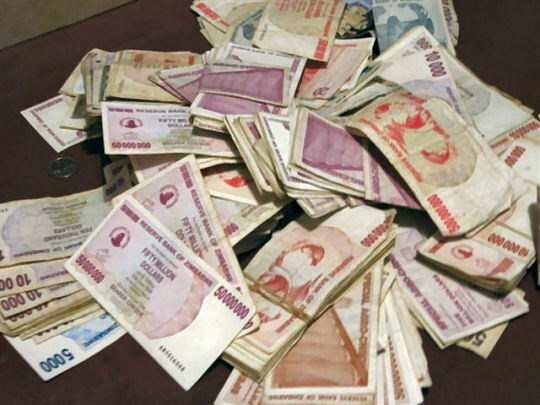 Money in Zimbabwe is safer under the bed than in a bank after zeros are wiped from the value of currency and banks find new ways to charge customers, writes Helen. The last time I checked my bank balance I had six trillion, three billion and 400 million dollars in my account. That was in January 2009. I have not spent or withdrawn any of that money but when I phoned the bank recently they said all the money had gone. The bank I am talking about is not a fly-by night, dubious, back-door operation but a reputable, international organisation. The last bank statement I received was almost two years ago in August 2007. Despite paying no interest to their customers for a number of years, the bank said they had stopped sending statements to their clients because they could no longer afford to do so. This was despite the fact that they charge customers for every service including withdrawing and depositing cash, use of the ATM, depositing out of town cheques and even for scribbling one’s account balance on a scrap of paper at the enquiries desk. Not to mention ledger fees, administration fees and more. All of these normal banking activities, and abnormal charges, collapsed in March 2007 when Zimbabwe stopped using its own currency and began trading entirely in US dollars. It was inevitable that something dramatic had to happen because Zimbabwe’s money situation had reached ludicrous proportions. In 2004 a number of banks, investment houses and building societies were closed overnight by Reserve Bank Governor Gideon Gono. Anyone with their life savings in one of these institutions lost everything. Next came the removal of three zeroes from the currency in August 2006. A thousand dollars became one dollar at the stroke of a pen and again we all lost as banks raised their minimum balance requirements and then charged customers huge penalties for having insufficient funds in their accounts. Thousands of accounts were simply closed down by the banks – no warning, no refund of remaining moneys, just gone. 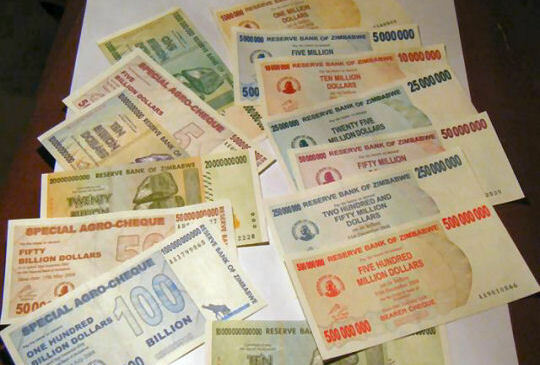 In August 2008 when inflation stood at 231 million per cent, Reserve Bank Governor Gideon Gono took more digits off the currency but this time it was dramatic: 10 zeros were removed. 1 billion dollars became 10 cents, 1 trillion dollars became 100 dollars. Within days banks restricted the amount of money people could withdraw from their own accounts. We had to queue for hours to withdraw the daily maximum amount allowed which was enough to buy less than half a loaf of bread. Each time zeroes were dropped, new bank notes were introduced and the old ones gathered dust in boxes under beds as they became nothing more than worthless scraps of paper. Range of Zimbabwe dollar notes. Most of the banks are now facing collapse with staff on 2 day weeks or on extended unpaid leave. Old customers whose millions, billions and trillions disappeared in the zeroes debacle, are suddenly being urged to come back and open new accounts. They are called FCAs (foreign currency accounts) but already the absurd conditions are in play. Deposit your US dollars, the banks urge, but then you can only draw out US$200 a day. There are no cheque books for US dollars, no ATM withdrawals will be allowed and you will pay US$3 for every withdrawal. I don’t think so. The money is safer under the bed. 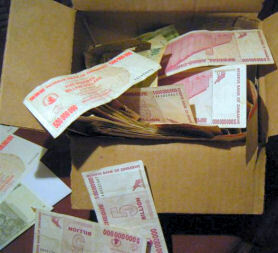 Zimbabwe currency, now worthless, stashed in a house. The Law – Instrument of Peace or Instrument of Repression? There has been a disturbing trend in Zimbabwe of the law being used to harass and arrest political opponents, human rights activists and human rights defenders. In the past six years, a conservative estimate of over 5 500 human rights defenders have been picked up and detained, but not one conviction has been secured by the State in these cases [Zimbabwe Lawyers for Human Rights]. And this is still continuing. Nevertheless, despite harassment and persecution, human rights defenders courageously continue their vital work – vital, because peace, stability and economic prosperity can only prevail in a society that fully respects the rule of law and human rights. · the Ludovic-Trarieux International Human Rights Prize for 2009 [to be presented in October in Paris]. This prestigious prize is awarded to a lawyer, regardless of nationality or Bar, who throughout his or her career has illustrated, by his or her activity or suffering, the defence of human rights, the promotion of defence rights, the supremacy of law and the struggle against racism and intolerance in any form. It is awarded jointly by the Human Rights Institutes established by the Bars of Bordeaux, Brussels and Paris, the European Bar Human Rights Institute and the Institute for the Defence of Human Rights of the Italian Bar. Beatrice is the fourteenth recipient of the award. She joins a distinguished company – the first recipient of the prize was Nelson Mandela in 1985. Alec Muchadehama, another leading member of the legal team defending the political abductees, was arrested on allegations of attempting to defeat or obstruct the administration of justice. What Mr Muchadehama did was to get three of the abductees [Chris Dhlamini, Gandhi Mudzingwa and Andrisson Manyere] released from custody on the basis that the State had failed to lodge its appeal against Justice Hungwe’s order granting them bail within the 7-day period allowed by the law. He spent the night of Thursday 14th May in a cell at Braeside police station before being released on bail the next day, when he was remanded until 28th May. On 28th May Mr Muchadehama’s lawyers challenged the charge as baseless and applied for him to be removed from remand, i.e., for the charge to be dismissed. That application was granted by the magistrate yesterday; she ruled that on the facts placed before the court by the State there was no reasonable suspicion that Mr Muchadehama had committed any crime. Unless the State resuscitates the prosecution, he no longer faces trial. Caught up in the same case, was judge's clerk Constance Gambara, who was arrested for abuse of public office arising out of her processing of paperwork for the release of Mr Muchadehama’s clients. She spent several days in Chikurubi Prison [with her nine-month old child], after the State initially indicated its intention to appeal against her bail. She was eventually released on 14th May when the State withdrew its appeal, and was remanded to 12th June. Women of Zimbabwe Arise [WOZA] have spent six years protesting the deteriorating health and education services in the country. Their ethos is non-violence and their protests include a yearly Valentine’s day march during which they hand out red roses as symbols of peace and love. Many have been beaten, picked up from their homes and threatened. They have been constantly arrested and detained, sometimes for weeks in insufferable conditions in police or prison cells. There have been thousands of arrests but only eight cases have gone on to trial – and all eight ended in withdrawal of charges or acquittal. On 4th June the Supreme Court will hear the case in which WOZA leader Jenni Williams challenges the constitutionality of the Criminal Law Code provision under which so many WOZA members have been arrested. The provision criminalises participation in gatherings with "intent to disturb the peace, order or security of the public". The court will be asked to invalidate the provision for its inconsistency with the constitutional sections protecting freedom of expression, assembly and association and movement. The Supreme Court will hear the case brought by Jestina Mukoko and other political abductees in which they complain that their constitutional rights were infringed by their abduction, lengthy unlawful detention, treatment during detention [including torture] and the State’s failure to take appropriate action against those responsible while at the same time vigorously pursuing criminal charges against the abductees. The court will be asked to stop the prosecution of the abductees until the case against their kidnappers has been fully investigated and prosecutions mounted against those responsible. As a constitutional case, this will be heard by five judges. The complainants’ legal team will be led by Advocate Jeremy Gauntlett SC of the South African bar. Deputy Attorney-General Prince Machaya will head the State’s team. Buhera public violence trial – 11 MDC-T members acquitted at the end of the State case of charges of public violence allegedly committed during the funeral of Mrs Susan Tsvangirai. Zimbabwe Lawyers for Human Rights have pointed to the Matinenga and Buhera acquittals as proving that the police continue to effect arbitrary arrests without first carrying out investigations and establishing a reasonable suspicion that a crime has been committed. Other criminal proceedings against MDC-T politicians have also ended in the State case collapsing, after causing serious disruption to the lives of the individuals accused – such as Tendai Biti’s weeks in detention on treason allegations last year [case never brought to trial] and before that the treason trial of the present Prime Minister [ending in his acquittal]. On 10th February WOZA members were active in central Harare, handing out flowers to passers-by and spreading their message of love. Police intervened and started apprehending them. Two Zimbabwe Lawyers for Human Rights lawyers, Rose Hanzi and Tawanda Zhuwarara, who happened to be in the vicinity on their way back to their office, were also arrested. The trial of the two lawyers and eight WOZA members began on 19th May in the magistrates court in Harare. All pleaded not guilty to charges of taking part in an unlawful demonstration on 10th February. When the trial resumed on 28th May all of them were acquitted at the close of the State case. The magistrate concluded that the police had shown ignorance of the law and had wrongfully arrested the accused persons, and that the State evidence had utterly failed to establish the offence charged. The magistrate also said he did not understand why the police had arrested women who were spreading a message of love. Two senior journalists with the Zimbabwe Independent, Editor Vincent Kahiya and News Editor Constantine Chimakure, will stand trial in the magistrates court on 16th June on charges of undermining public confidence in law enforcement agents. They published a story naming certain CIO and police officers as being implicated in the abductions of the political abductees. That story was based on the contents of the official trial documents served by the State on the political abductees [see Peace Watch of 6th May].